Monday June 21st 1909 I did a big washing done this morning. Will took back the lumber that was left and some oats to grind for feed. Hattie was out in the morning for their butter. I put in the afternoon scrubbing floors to get some more plaster. Will had to go back for his feed. The men brought the Little mare of Mr Lewis Browne here. There was a terrible storm about five oclock. 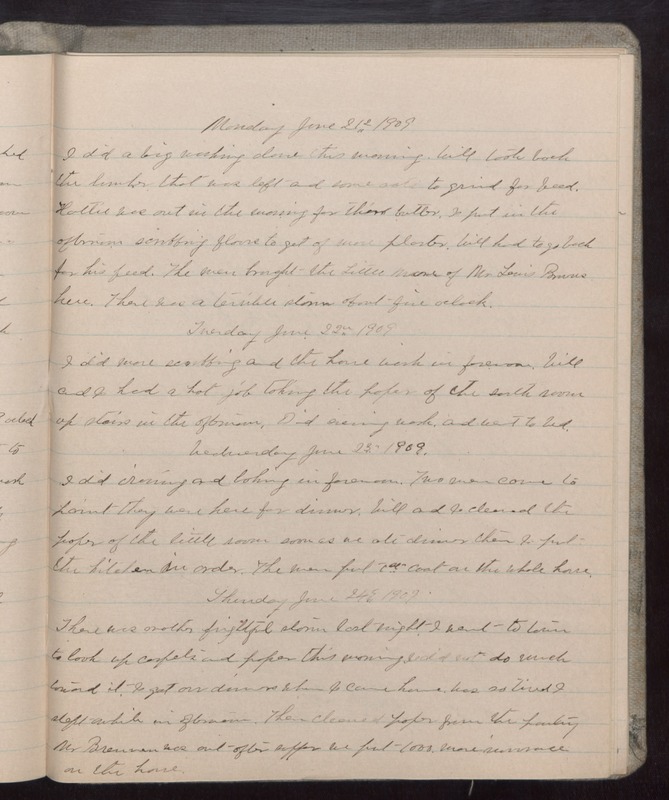 Tuesday June 22nd 1909 I did more scrubbing and the house work in forenoon. Will and I had a hot job taking the paper of the south room up stairs in the afternoon. Did evening work, and went to bed. Wednesday June 23rd 1909 I did ironing and baking in forenoon. Two men came to paint they were here for dinner. Will and I cleaned the paper of the little room soon as we ate dinner then I put the kitchen in order. The men put 1st coat on the whole house. Thursday June 24th 1909 There was another frightful storm last night. I went to town to look up carpets and paper this morning I did not do much toward it. I got our dinners when I came home was so tired I slept while in afternoon. Then cleaned paper from the pantry Mr Brennan was out after supper we put 1000 more [insurance?] on the house.